If you are in need of the right words to write something truly inspirational for your brother’s birthday, you’ve come to the right place! 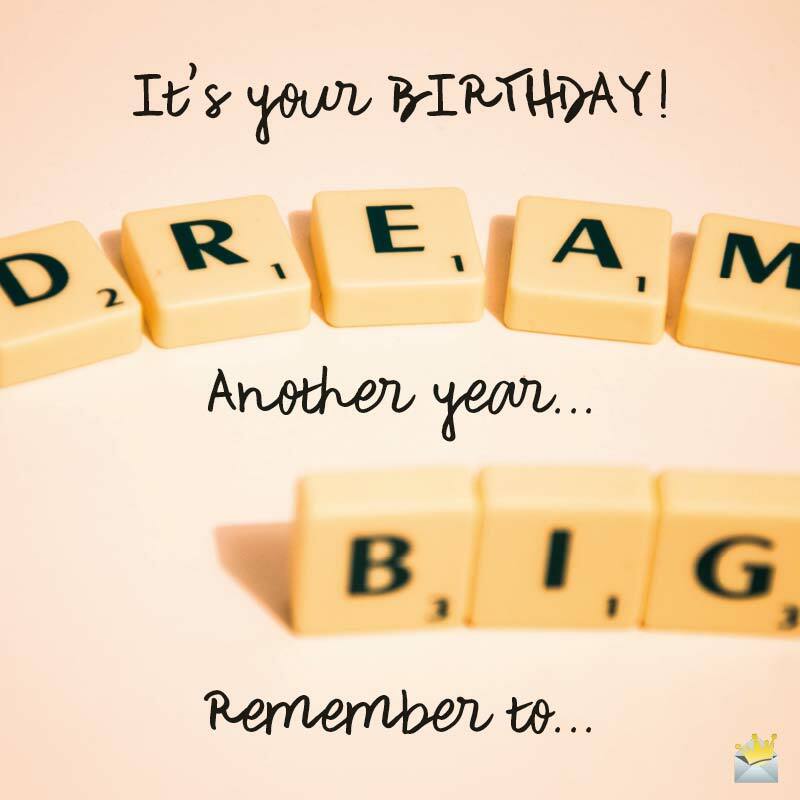 Use any of our tons of inspirational birthday wishes below to brighten your brother’s big day and motivate him to bring out the best in himself as he embarks on a new phase of his life. Brother, there isn’t anything under the sun that you cannot achieve if you set your mind to it because I see nothing but a great achiever in you. Happy birthday! I believe you are destined to attain greatness. So today, I wish you abundant strength and wisdom to be able to realize all those great aspirations of yours. Happy birthday! Don’t be afraid of the dark clouds of troubles that hang over your head because the sun will soon appear and they will all vanish. Happy birthday! Happy people aren’t those who have everything in the world but those who appreciate what they have. May you become one of the happiest souls to have ever lived on earth! Happy birthday, bro! It doesn’t matter whether you have millions in your bank account or you are penniless. Once you are alive and kicking, that’s all that matters. I hope you make this special day the best one you have had so far. Happy birthday! Happy birthday, dearest brother. Please, don’t forget that you carry in you so much potency to translate all your dreams into reality. I wish you physical health and wisdom to accomplish all you desire. Celebrate today, knowing that you’re one of the greatest treasures life has ever gifted me. Wishing you tons of fun on your birthday anniversary, dear brother! Happy birthday! Come what may, never stop pursuing your dreams, for I see an incredibly bright future ahead of you. Have all the fun there is in the universe. No matter how tough life may seem, always face it with great optimism and trust in yourself that you can make it. If you do this, no obstacle on your path to success can’t be conquered. Happy birthday! Wishing a magically beautiful birthday celebration to the superhero of my life! Brother, you have really accomplished a lot in life and I congratulate you for that. May even more success, love, good health and joy walk with you through the rest of your journey on earth. Happy birthday! This is a new stage of your life, so do not let the troubles in the past hold the brilliant future ahead of you hostage. I wish you the best in all the endeavors of your beautiful life. Happy birthday! Make the sky your starting point and you will soar higher than you ever imagined you could. Happy birthday, bro! Have no fear in going after the desires of your heart because God brought you to this world to do the exceptional. I wish you a birthday filled with blessings from the deepest treasuries of heaven! I wish your accomplishments for the coming years will be a hundred times more than what you achieved in the previous years. May yours be the happiest of birthdays, dear brother! Your new age has countless blessings in store for you so arm yourself with faith, hope and the willingness to succeed. Have the merriest and sweetest of birthday festivities! Close your ears to the words of discouragement that come to you and trust in yourself, for you were born great. Keep on shinning, brother. Happy birthday. I am over the moon not only because this day marks your birthday, but also because it marks the day that my greatest inspiration was born. With all the love in my heart, I say, “Happy birthday, my brother and greatest inspiration”. Take a little time for reflection. Even if you fall a million times in the pursuit of your dreams, have the courage to rise a million and one times and continue chasing after those dreams. Happy birthday. No emoji or words can express how much you inspire me in life. May your life be adorned in the most beautiful blessings from above! I wish you the greatest of birthdays ever! May your new age usher into your life wonderful blessings and inspire you to walk boldly into the bright future God has prepared for you. Have the merriest and sweetest of birthday festivities! God programmed you to be great, so not even the greatest trial life throws in your way should discourage you. Happy birthday. Happy birthday, brother! Never stop being cheerful in life, for your future is as brilliant as the sun that shines at noon. Occupy your mind with positive things and amazing blessings from above shall forever make your world their abode. Happy birthday. Believe in the beauty of your dreams and work towards their materialization and your future will be full of nothing but contentment and bliss. Happy birthday, bro! Leave the hurtful past far behind you and God will bring happiness and joy into your soul. I hope you have a great time celebrating your life today. Don’t remain where you fell, dust off yourself and carry on to the end in order to win the ultimate crown. Happy birthday. This day can be the best day of your life if only you face it squarely with positive thoughts. Have a ridiculously joyful and blessed day. It’s your Birthday! Remember to dream big! Nothing in the world is too difficult to accomplish if the principle of hard work is applied. May your Big Day be nothing short of joyous. Since time immemorial, hard times have always led to greater accomplishments. And things are no different today. So never give up, come what may. Happy birthday. Don’t allow the words of the pessimists to sway your attention from what you want to achieve. Have trust in your abilities and you shall accomplish the unaccomplishable. Happy birthday. There is a beautiful treasure hiding in any obstacle that is thrown in your way, and it is your duty to find it. So don’t quit yet. Have yourself an absolutely fantastic birthday celebration. As we drink a toast to this new chapter of your life, have in mind that you have been blessed with the power to achieve anything you wish for. Have the merriest of birthdays!